We are a Sheffield-based family run business offering Payroll and Budget Management Services. Parkside Payroll offers families a reliable simple payroll service which frees them from the worry of dealing with HMRC; keeping accurate records for them. We also offer a more comprehensive Budget Management service. With years of experience in working with families with disabled young people and also, more recently, older people receiving Direct Payments (whether funded by Social Services or NHS or both), we know that they value the peace of mind a reliable, friendly and local business can provide. This frees them to spend more time with their family which is what they most need. We have learnt that being available to respond quickly to anxieties and payroll queries is a quality which is greatly appreciated as is having genuine understanding of individual families’ needs. We work both with families receiving Direct Payment from the local council and those making a private arrangement and we provide a service which is tailored to a family's individual needs. 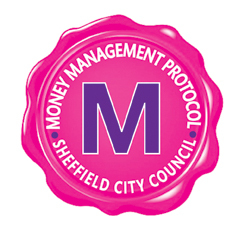 We work closely with Sheffield City Council and follow their Money Management Protocol. 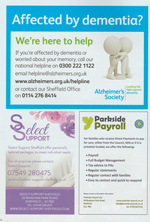 You can also find us on Sheffield City Council's "Help Yourself" site, now known as "Sheffield Directory". could complete and return. It helps us to keep improving our service. Thank you. On 15th March the office will be closed for the day! It will be the only working day we have been closed in 4 1/2 years!! We are off on a family weekend away to celebrate Debi's Big Birthday (Not big enough for a telegramme though!) We will be back on duty from lunchtime on Monday 18th. We have now added some of the most requested payroll documents to our Information page. They can always still be requested in paper form from us. It's that time of year when HMRC sends out copious quantities of reminders to pay electronically. Any of our families who receives one of these, don't worry and just keep on paying as you have been, just as we will do with all the families' budgets we manage. That's 125 letters, envelopes and 1st class postage just to the families we deal with...makes you think! Happy New Year to all our families, PAs, service providers, friends and supporters. We hope it is a good year for everyone. Whilst we worked most of the Christmas period, with the curtailed postal collections there may have been some delay in families receiving paperwork, though hopefully this caused minimal disruption. As we are rapidly approaching the Christmas holidays we would like to remind families and PAs that we are happy to receive timesheets early in order to process them promptly. We would like to wish all our families, their PAs, service providers, our friends and supporters a very Merry Christmas and a Happy New Year! It is with amazement that we have realised we have already been "in business" for 4 years now! 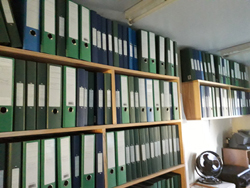 From tiny beginnings we have grown steadily and are delighted to have had to make upgrades to our office this year to accommodate all our families files. Not many of you will have ever seen the inside of our office so here is a glimpse of it. Thank you to to all the families, PAs, Social Workers, providers and friends who have made these first 4 years such a pleasure. We often get requests to help families recruit PAs. Our area of expertise is all things financial and we are not able to recruit for families. We do however always offer to post on our Facebook page and forward any responses. This has been successful for some families and we are happy to help like this when we can. So please do check our Facebook page regularly....and "like" us. Thank you. 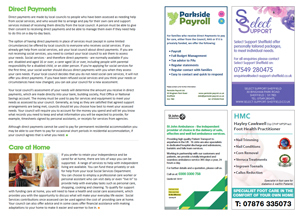 Following the sad and untimely death of one of our clients, we have put together a leaflet about redundancy payments. This is rare for carers, but occasionally it is relevant. The leaflet is on our information page. As a result of working closely with a Personal Assistant who is continuing to work past "retirement age" we have added an information sheet about retirement age and pensions to our information page. He has found it useful, we hope it will be for others too. We are delighted to have signed our 100th family. Mum turned out to be an old friend so we are delighted to be working with her again. We welcome all the new families of recent months and look forward to working with you all -even when there are some complex problems to unravel! June 11th-18th is National Carers Week. At Parkside Payroll we would like to acknowledge and show our appreciation for the amazing work done by carers, both paid and unpaid. Thank you to you all. Thank you to those families who have returned feedback forms to us, we have included some new comments on our feedback page. From 1st April there is a new National Living wage of £7.83. As yet SCC haven't increased the payments for PAs to take account of this. We have contacted them to find out how quickly this might happen. As last year, we expect it may take some time but PAs will receive the increased amount backdated to 1st April. Patience may be needed! Many people may not have realised that Daniel was in sole charge of the business for 4 weeks, whilst Debi went off on a grand adventure, as things continued seamlessly. It has been a delight to have received so many phonecalls praising not only his work and commitment but also him as a person. He achieved all this and took care of a crisis with his 93yr old grandad and Debi's sudden illness on her return! Parkside Payroll is lucky to have such a dedicated, kind, caring and hardworking young man at its heart. Firstly, Happy New Year to all our families, old and new, our other clients, friends and supporters. We hope it is a good year for everyone. And secondly, a warning that a couple of our families have received phone-calls supposedly from HMRC telling them a lawsuit is being filed for non-payment of tax and asking them to press a button to speak to someone....these are hoaxes, this is not how HMRC works, so please just disconnect! Just a reminder, as Christmas approaches, that you can send in timesheets early. We will then get payroll processed accordingly and if necessary make any adjustments the following month (if hours aren't completed as expected). With best wishes for a Merry Christmas and a Happy New Year to all our families and friends. 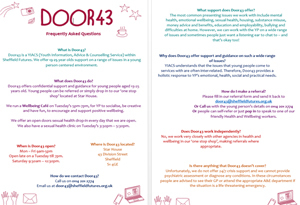 We have been told by Social Services of a new service for 13-25 year olds offering support and gudance around mental health and well being. It is available as a drop in service and is free. Here is their leaflet. We are delighted to announce that Debi has become a trustee at The Golddigger Trust, an award-winning Sheffield charity working with young people around areas of self-esteem and sexual exploitation. We thinks this fits well with our ethos here at Parkside Payroll. A link to their site is now on our information page. Pensions! Several families with long term DP packages have now reached the staging dates. We are enrolling you all as fast as we can! For newer families when you get a letter from The Pensions Regulator Don't Panic! Please just forward the letter to us and we will take over! Just a reminder that at holiday times (whether school holidays, public holidays or your own holidays) we are more than happy to receive timesheets early so that PAs can still be paid on time. And for those of you with children - have a lovely Half Term. 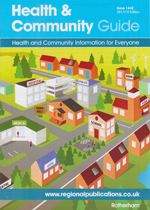 We are now featured in the Rotherham Health and Community Guide. Sheffield City Council have just issued a revised list of contacts for Adult Social Care teams. To download a copy of the document just click on the link. Another busy month, so welcome to all our new families. We look forward to working with you. We have also had several calls asking about our fees so we have added an information leaflet to our information page, although phone calls are still always welcome! 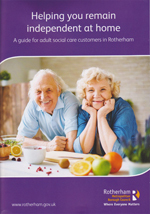 We are now on page 48 of the new Rotherham Brochure being distributed to help people wanting to continue living independently in their own homes. We look forward to working with those families in Rotherham who need a friendly local payroll/budget management service. We are now on the Money Management RPL and have a new pink logo to use! Just a reminder that with the start of the new tax year rapidly approaching, we will be updating tax codes for 2017-2018. If HMRC sends change of tax code information straight to you, please make sure we also have a copy! Thank you. We are delighted to announce that when Sheffield City Council opens its new Money Management Recognised Provider List (RPL) on 1st April that we will be included and will get another logo to display! The list has been closed for years while criteria were reset and a rigorous application process has now been successfully completed. A warm welcome to our new families this month! 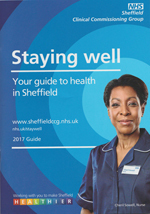 We are delighted that the new NHS "Staying Well" booklet has arrived in the post this week. Page 12 is of special interest! 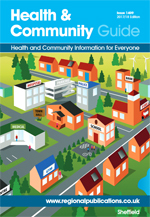 The booklet will appear in clinics, surgeries, libraries and many other places across the city. Happy New Year to you all! We're off to a flying start with everyone having got timesheets to us so promptly that we started the New Year up and running. And a very warm welcome to our new families and new business clients, we look forward to a happy and successful working relationship with you. As the Christmas holidays rapidly approach we'd like to remind families and PAs that we are more than happy to receive timesheets early in order to process them promptly for you. 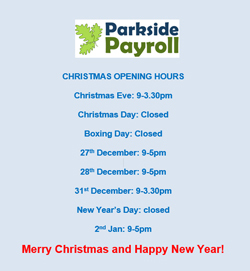 We would like to wish all our families, PAs, friends and supporters a very Merry Christmas and a Happy New Year from all at Parkside Payroll. Do you receive social care or health care support? Do you support someone who receives social care or health care? Are you a practitioner working with people who receive social care or health care support? If so we would like your views on Direct Payment Support in Sheffield. We would like your views even if you do not receive a direct payment or fund your support as it is important to find out why people chose not to have a direct payment as well as the experiences of those who do have an direct payment. The findings will be used to help influence the support available for people in Sheffield who manage their own social care and health care support and the development of future direct payment support in the City. On behalf of Sheffield Individual Employer & PA Development Group and in partnership with Sheffield City Council, Disability Sheffield have secured some funding from Skills for Care for this project. A steering group made up of people in receipt of social care and health care support, family carers, council and NHS officers and Disability Sheffield will be co-designing Direct Payment Support for the City using the findings from the survey, building on individuals experiences and looking at good practice in other parts of the country. In the New Year we will be inviting you to a meeting to share the findings and for you to have the opportunity to help us shape our proposals for Direct Payment Support in the City. We are delighted to now be working with Baby Basics UK, one of Sheffield's premier charities. We are looking forward to a long and happy working relationship. For more information on Baby Basics and the wonderful work they do, there is a link to their website on our information page. Whilst in Oxford for the weekend Debi was able to visit our southernmost client and attend her fundraising and awareness afternoon for those suffering with Frontotemporal Degeneration (classed as a rare dementia) Most people (including doctors!) have never heard of this, but it has just gained a slightly higher profile following the news that Terry Jones of Monty Python has it. Rita and her daughter are delighted to have finally found a support group in the UK so their isolation is hopefully at an end. Links to useful sites are on our information page. We are delighted to have met and got to know Tracy Rose, a trustee and parent involved with the PDA Society. Their website may be very useful to other families. After a lost application and a lot more form filling in we are delighted to have finally joined Sheffield City Council's Recognised Provider List! Even with rising numbers of families we are delighted that we have been able to process every timesheet, pay every PA and send out all the end of month summaries and it's not even 10am on the 1st of the month! We thank you all for the part you play in getting information to us so promptly. There is a new payslip explanation fact sheet now added to the information page which has been made to help make things clear for all our PAs and families, especially those who haven't had holidays listed on payslips from other providers. Just a reminder that you don't have to wait till the end of the month to send in time sheets if the hours are known in advance. It may be easier over the summer for some families to send them in earlier. This may especially be true next month with the Bank Holiday! Please do get in touch if you have any queries about this. The government is planning a new strategy for carers and wants input from carers themselves. If you go to their website you can be part of this. You have till 31st July to complete the survey. What with May Bank Holiday and schools' half term we are impressed how many families have managed to get their timesheets to us so promptly. Also well done to all those PAs who have contacted HMRC to have their tax codes split across jobs: more money in your pay packets! We hope everyone enjoys a pleasant Bank Holiday weekend. We have been up to WORK Ltd today with our friends at Select Support to have a cup of tea and cake in their newly refurbished cafe The Hidden Gem Cafe. Lovely surroundings, such friendly and welcoming people and delicious cake :) We can highly recommend it! We're rapidly approaching that slightly hectic year end...all outstanding holidays will be credited in this final pay period of the tax year. P60s will also be sent out to everyone with any payroll processed at the end of the month. For any that fall early in April the P60s will be sent out then. We are also enclosing feedback sheets with this payroll as a way of constantly monitoring our service, so please do complete them if you can. What a great way to end the week - One of our lovely "Managed Account" families has had some great news today. Their young man, following a review, has been awarded significantly more hours which will enable him to have the support he really needs, and that mum really needs too. Well done to Select Support and especially their social worker for making this happen. Our small part in the process was to support mum through her worries over money, contributions etc. We don't just manage the account, we help manage our clients' anxieties too. Just as a footnote: Their Hidden Gem Cafe is due to reopen after refurbishment on 14th March. One of our parents has just posted this on her facebook page and we'd like to share it as it is relevant to those with children with SEN.
"Heads up for SEN parents. This is confirmation from Sheffield Parent Carer Forum..in case your SENCO or LA tell you differently. While your child still has a statement, the relevant sections of the OLD Code of Practice apply to them. Until April 2018, the old and the new legal system will be running in tandem, and which law applies depends on whether your child has a statement or an EHCP." We hope this useful information might help others. We are open to process the payroll through most of the holiday, but if any family would like it processed early, please send the timesheets to us whenever suits you and we can do this, (though not on Christmas Day!) We would like to wish all our families, PAs, colleagues and friends a very Merry Christmas and a Happy and Healthy New Year. We are proud to announce that we are now closely working with a new support service provider which offers which offers quality support workers and personal assistants to families and individuals. For further information please go to their website. We look forward to a long and happy working relationship with them as their services complement ours perfectly. What a pleasure and a privilege to attend a piano concert performed by one of our young men, Zak Meyer and his friend Max Day. Amazing playing –these boys learn by ear and play from memory –astounding! And the final piece where they played “in competition” was played with such humour and skill it was brilliant. Not only that but there were excellent cakes in the interval and on top of it all the boys raised £234 for Children in Need. Talent and generosity of spirit –truly inspirational. Despite the growing number of families we are delighted to say that yet again everyone submitted their hours in sufficient time for us to put in a really long day on 30th and get everyone's payroll processed before the end of the month -I'm sure your PAs will be very grateful. Thank you to you all. We have added information on Sick Pay to our Information page, following requests from families. We hope this helps, but please get in touch if we can help further. A flurry of new families this week, welcome to you all. We hope to have a long and successful working relationship with you. Hopefully we have answered all your questions, but you and our existing families are always welcome to contact us with any query no matter how "silly" it may seem. Those of you new families, who are also employers, have had your registration with the Pensions Regulator updated. Welcome to our new families this month. We look forward to working with you. Existing families are now all registered with the Pensions Regulator, even those whose letters went astray! Thank you to all our wonderful families and PAs as every one of you got your timesheets/hours to us by the last day of the month, especially as it is the school holidays for some. To show our appreciation we extended our working hours to make sure every single one was processed by the end of Friday. So all PAs and all invoices were paid and the paperwork was in the post before the end of the month – fantastic. Special thanks to the lovely lady who took time to phone us before going back into hospital –just to make sure her PAs were paid! We know your PAs will all be grateful to have their wages so promptly. So thank you everyone. For anyone who has received a letter from the Pensions Regulator and not yet forwarded it to us or contacted them yourselves please be aware there is a deadline of 31st July! So there is still time. Please get in touch if you have any questions. Families have started receiving correspondence from the Pensions Regulator. This is causing anxiety for many. Please do not worry. We will help guide you through this. We have put the main information on our Information page to help you. As with anything, don't worry alone, get in touch with us and we will do our best to help you. Thanks to every one who has returned their feedback form -some of the kind comments now feature on our new feedback page. If you haven't returned your form, it is not compulsory! But it does help us monitor and improve our service to you. Just a reminder to send any notifications of changed taxcodes to us. HMRC doesn't always send them directly to us and we want to keep your records up to date for you. The year end is almost upon us. Please let us know any holidays taken so we can complete the year accurately. P60s will be on their way to PAs with this payroll. Welcome to our new families this month. It has been a great start to the month. We're particularly delighted to welcome our first family from outside South Yorkshire! We look forward to a long and happy working relationship with you. We have been asked if we can offer families an independent minute-taking service for review meetings. With years of experience in minute-taking we are delighted to be able to offer this service. Please get in touch if you would like to use this service. We are now offering payroll services to small local businesses too, although our core business remains with families as we particularly love this work. We would like to wish all our families, PAs, friends and supporters a Happy New Year. We look forward to working with you in 2015! Copyright © Parkside Payroll Ltd. All Rights Reserved.